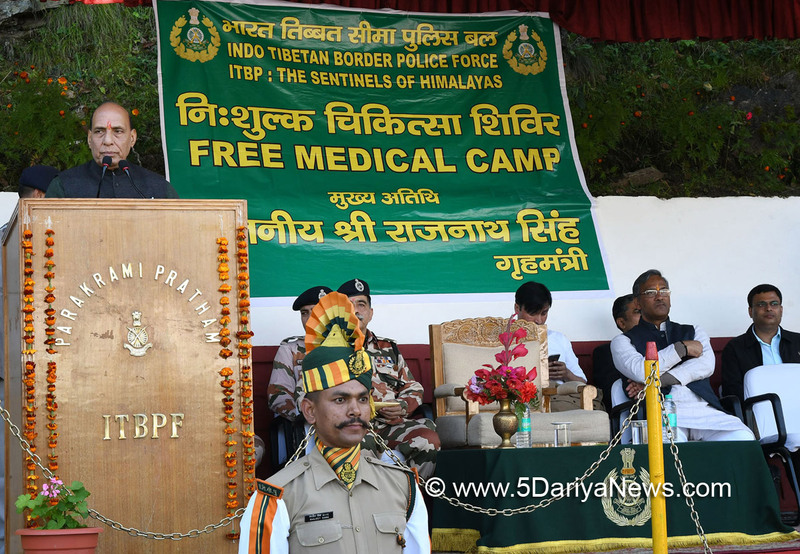 The Union Home Minister, Shri Rajnath Singh addressing at the Free Medical Camp organised by the ITBP, at Joshimath, Uttarakhand on September 30, 2017. The Union Home Minister Shri Rajnath Singh is on a four-day visit to the state of Uttarakhand. On the third day of his visit today, Shri Rajnath Singh visited the Lapthal and Rimkhim Border out Posts (BOPs) of Indo-Tibetan Border Police (ITBP). The Union Home Minster interacted with the jawans and greeted them on the occasion of Dussehra festival. He inaugurated the Civic Action Programme and Blood Donation Camp at Joshimath and addressed at the free medical camp organized by ITBP. He had visited the BoP Mana of ITBP yesterday. He will conclude his visit to the state tomorrow.